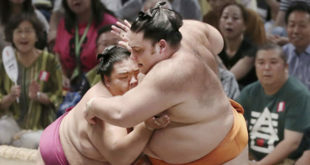 Les deux ôzeki Goeido et Takayasu étaient tous les deux kadoban en début de tournoi, à la merci d’une dégradation s’ils n’atteignaient pas le kachi-koshi, les fameuses 8 victoires libératrices. 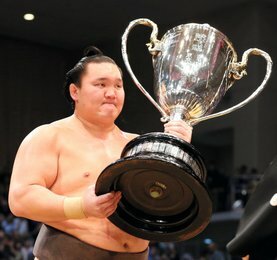 Les deux lutteurs l’ont atteint aujourd’hui (Goeido en avance hier), et Takayasu s’est même payé le luxe de sortir le leader du tournoi, le sekiwake Mitakeumi. Ce dernier est toujours en tête avec ses 11 victoires, et possède encore deux longueurs d’avance sur ses poursuivants, les maegashira 13 Tochiozan et Asanoyama, qui ont perdu tous les deux leur combat du jour, respectivement contre Myogiryu et Kaisei, et restent scotchés à leurs 9 victoires. Chez les komusubi, les fortunes sont diverses puisque Tamawashi acquiert enfin sa 7ème victoire mais doit obtenir la 8ème avant dimanche. Quant à Shohozan, il continue à végéter dans le fond du classement avec seulement 3 victoires pour 9 défaites. Nouvelle défaite de Endo, ce coup-ci contre l’ôzeki Goeido, mais le maegashira 6 a déjà atteint le kachi-koshi. 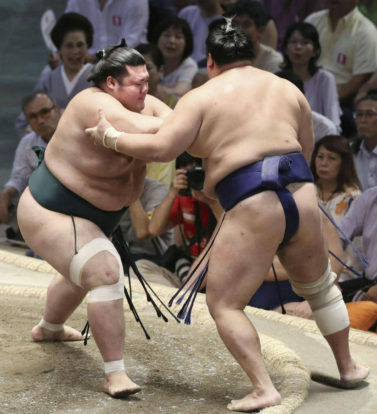 NAGOYA – Sekiwake Mitakeumi suffered his first defeat at the Nagoya Grand Sumo Tournament on Thursday, losing to ozeki Takayasu. 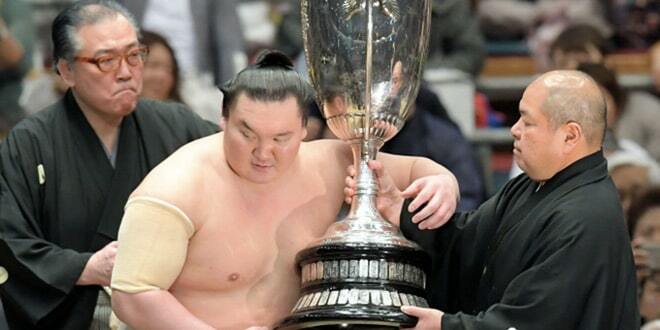 In the final bout of Day 12, Takayasu went for a shoulder blast from the jump but conceded a belt hold to the tournament leader, who turned the ozeki around and moved him to the edge of the straw. 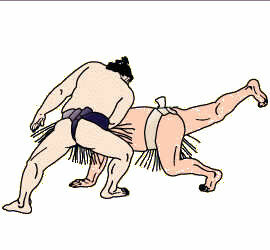 As Mitakeumi attempted a final shove, Takayusu pushed him off balance, with both wrestlers appearing to tumble from the ring simultaneously. 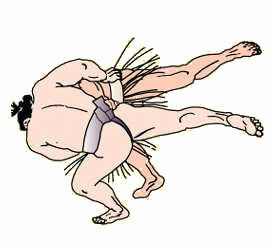 After conferring, the officials determined Mitakeumi’s foot touched the outside of the ring first. The victory ensures Takayasu (8-4) will leave Nagoya with a winning record and maintain his ozeki status at the next tournament. Despite the loss, Mitakumi (11-1) retains the sole lead at the 15-day tournament as he pursues his first top-level title. 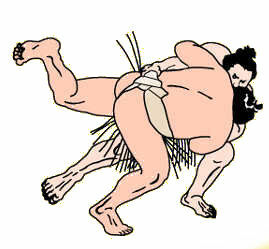 Ozeki Goeido (9-3) remained in the hunt by pushing out No. 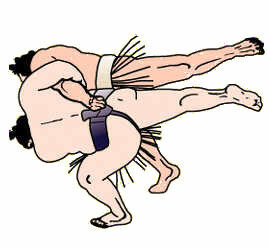 6 maegashira Endo (8-4) in the penultimate bout of the day. 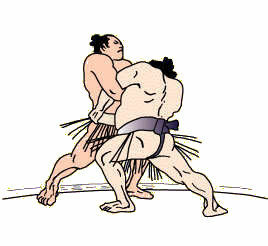 Endo tried to pull down the onrushing Goeido, but the ozeki kept driving low and hard to bulldoze the maegashira from the ring. Three rank-and-file grapplers — Tochiozan, Yutakayama and Asanoyama — still have a chance to overtake Mitaekumi after also finishing the day with 9-3 records. No. 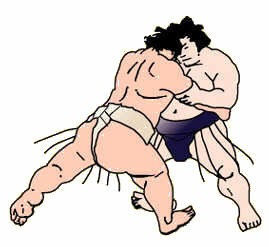 13 Tochiozan lost his bout against ninth-ranked Myogiryu (8-4), while fellow No. 9 Yutakayama beat No. 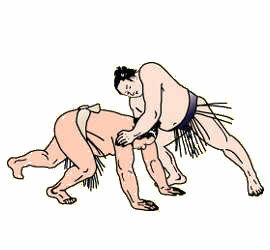 16 Hokutofuji (8-4). No. 13 Asanoyama lost to Brazilian-born No. 4 Kaisei (8-4). Sekiwake Ichinojo (6-6) kept his hopes of a winning record alive by beating No. 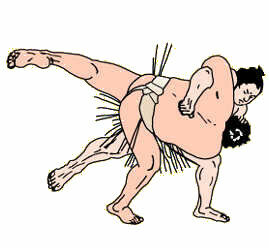 4 Kagayaki with an overarm throw. 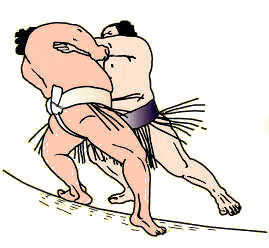 The maegashira thrust into Ichinojo at the jump, but the 225-kg Mongolian kept his footing, patiently securing a belt hold before twisting Kagayaki to the clay. Komusubi Tamawashi (7-5) moved within one victory of a winning record after dispatching No. 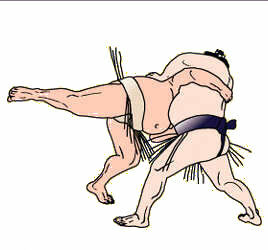 2 Chiyonokuni (6-6) with an arm throw. 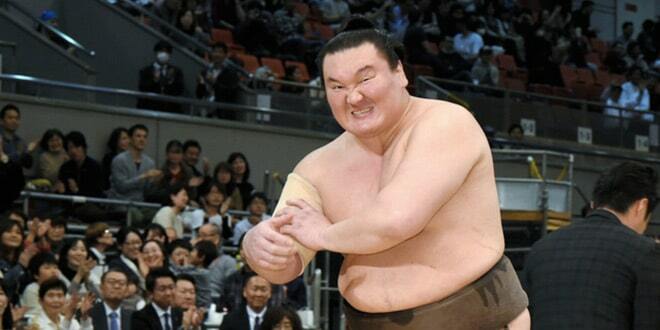 Fellow komusubi Shohozan (3-9), who is set to drop from three sanyaku rankings beneath yokozuna, was dropped by No. 3 Abi (3-9). Pas d’accord! 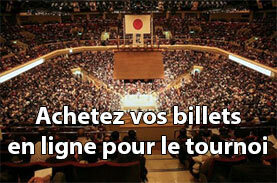 Takayasu a touché l’extérieur avec un orteil avant mitakeumi!! après le départ des trois grands champions en début de premier semaine, ce tournoi n’est pas des plus passionnant. J’ai même de la peine pour Yoshikaze qui n’a toujours pas gagné un seul combat. Petite question : est ce que Tamawashi peut être sanctionné suite aux blessures qu’il a causé à Kotoshogiku et Chiyonokuni ?? Moi , j ‘ai pas été étonné . Sinon , une question qui n ‘a rien à voir avec ce tournoi .